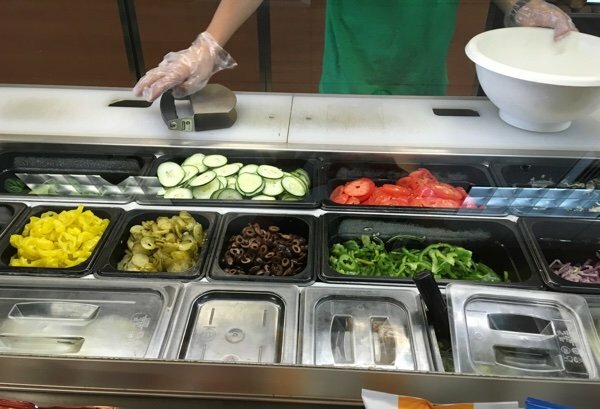 Which is the Healthiest Salad at Subway? Which is the healthiest salad at Subway? Did you even know they served salads? I didn’t! I mean the store is called “Subway” so I thought it was only sandwiches. I am without a clue on many, many things. Last month, I wrote Which is the Healthiest Bread at Subway? only to find out that many of my readers don’t eat the bread. Hey Lisa ... Did you know you can get a Subway with NO BREAD? They put your requested ingredients in a bowl and chop it and then I like a little vinegar and oil with a sprinkle of oregano on it and you’re good to go! This is the answer for gluten free too. So, I went back to check out the salads to see what I could find. Turns out you can turn ANY 6-inch sub into a salad. Wow! You have to add $2.20 to the purchase price of the sandwich. 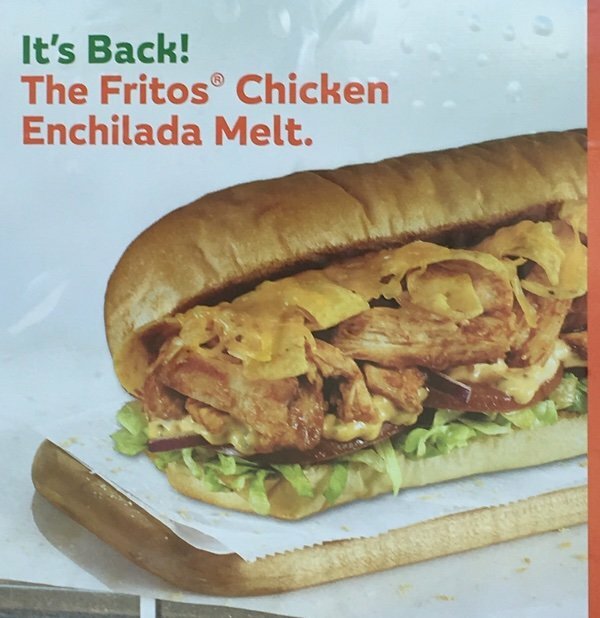 It is pretty easy to find the healthiest salad since I hope you know better than to order this FRITO sub in salad form. Yuck!! If you want Fritos – just go buy a bag. Sheesh. 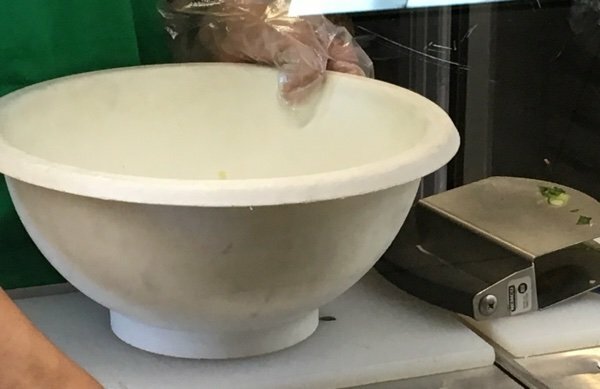 At any rate, the way the salad works is the same as the sub except they use a bowl (see below) that they wash between uses and a chopper. The chopper ensures that all your ingredients will fit on a fork. They do not chop the lettuce as it is already pre-chopped. Just like the sandwich, you choose what you would like on it from the healthy section. I asked for everything because I like all the options. I do think that next time I will not have banana peppers and jalapeno slices because it was a bit too spicy. Just go with one or the other if you are an “everything” person. Then, you choose your meat (or no meat) and cheese. This is the side that you should be very careful on because there are a big range of ingredients – many of them should be avoided. First, NO CHEESE. Cheese does not belong on a salad. Sorry, but I hate cheese (except for grated Parmesan) on my salads and you don’t need it to make a delicious salad. Second, stick with lean meats such as the turkey breast or the chicken breast. I asked what most people get on for their salad and it was either tuna or chicken breast so I decided to try two different salads. You don’t need Ranch or anything else that is called “creamy” – 100 calorie and UP! My favorite is the vinaigrette but I am a vinegar fan. 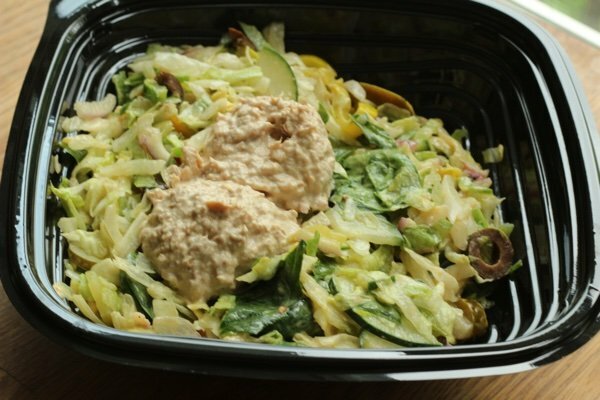 This is the Subway Tuna salad with everything and Subway vinaigrette. Do you know what I did wrong? I didn’t know that the tuna had mayonnaise added to it. I should have guessed but they called it tuna so I thought it was just tuna. I mean how stupid am I? So, this was not a very healthy choice because the tuna added 250 calories and 23 GRAMS of fat to my salad. I am not saying that fat is unhealthy but that is half of my daily value of fat in one meal. This is too much fat for a salad. It did taste pretty good as you can imagine. 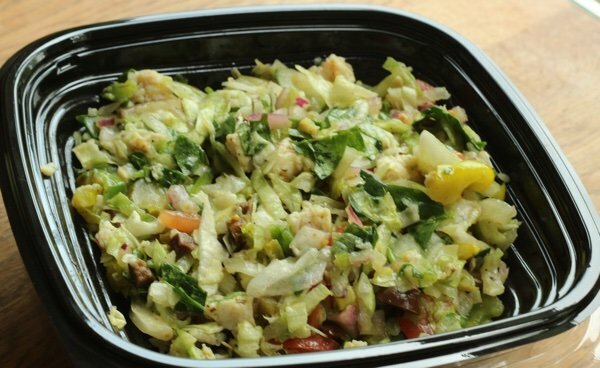 Below is the winner for healthiest Subway salad. This is all of the vegetables and a 90 calorie chicken breast added to it with the Subway Vinaigrette – which makes this one Freestyle SmartPt for those Weight Watchers members out there. The salad maker heated up the chicken – which is a good idea because cold chicken breast can be kinda tough. Then he chopped it up into the salad. I think next time, I will ask him to slice it and lay it on top. I couldn’t find the chicken with all the other stuff swimming in the salad. Both of these salads set me back $7.39 but as far as a fast food salad goes – I liked it. It is far more customizable than any of the McDonald’s or Wendy’s options and I thought it tasted pretty good. 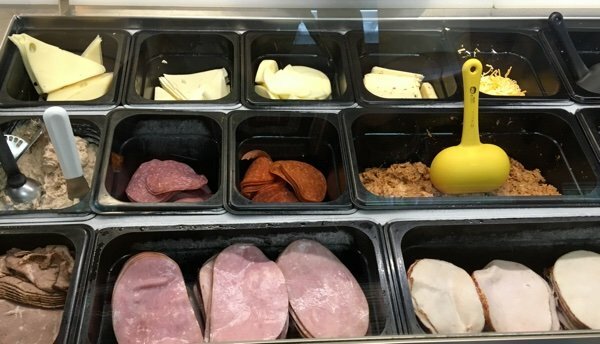 What do you order for a Subway salad? What healthy options have you found? Which is the Healthiest Bread at Subway? So, if one doesn’t eat chickens, perhaps a little cheese to add protein is better than the tuna or not?? A real question, not a smart Alec. I just learned about Subway salads yesterday during a layover in Chicago. I was unable to find a healthy looking food on several of the restaurant menus I checked. 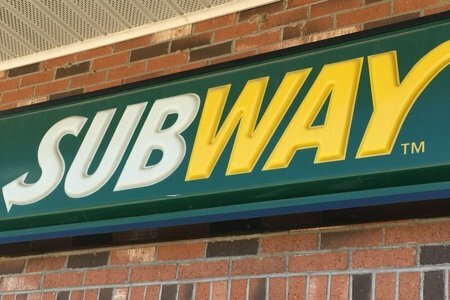 Then I came to Subway and thought I'd settle on a sandwich. I happened to see the salad alternative and that was even more appealing. I skipped the spicy peppers and cheese and chose ham and chicken. They were small thinly sliced deli type slices which appeared lean. They offered fat free Ken's ranch or Italian packets. I had the Italian and it was one Weight Watcher's SP but I only used half. I counted the meat as 3 SP's though I doubt it was that much. The salad was served with a pack of croutons. I opened them and just ate a few for the crunch. I easily kept this Subway choice under 5 SP's and was totally satisfied. Huge salad! Great alternative! I get the double-chicken chopped salad with everything except black olives and jalapenos. I will sometimes not add any dressing, because the dill pickles add a little "vinegar" taste. This is a BIG salad...could probably divide into two meals, though I rarely do. I have been eating Subway salads for the last 10 years. It is always my go to option and I often get extra chicken - no cheese. I have been eating Subway salads for the last 10 years. It is always my go to option and I often get extra chicken - no cheese. And you can ask for the dressing on the side so you can control the amount you put on your salad. I never even thought about doing this but will certainly give it a go...maybe for lunch today. Thanks very much for all the tips and tricks I gt on here. I get the spinach salad with double the rotisserie chicken (left cold) and lots of veggies with a small amount of honey mustard on it....very satisfying! I didn’t know that Subway offered chopped salads. Their fixings are fresh so the salads may not be that bad. One of these days I might try one. I like the tuna salad with veggies over spinach instead of lettuce, a dusting of cheese and vinegar. But I eat half of it and take the rest home for another meal! I love Subway salads! I usually get everything but jalapenos and pickles. Chicken or turkey and oil and vinegar! I like provolone cheese too sometimes! Delicious!